The following report comes from David Riby, CPD – March 2018. 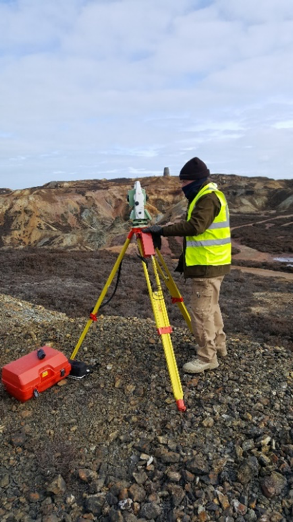 Camborne School of Mines (CSM) run an annual field trip as part of their post-graduate course in Surveying, Land and Environmental Management. I have been attending the course for the last few years to assist CSM in the teaching of surveying and with a view of developing my own training skills. It takes place at Parys Mountain in Anglesey, a prominent hill within the locality of Amlwch, which is a Volcanogenic massive sulphide ore deposit containing mainly copper and zinc. It was mined extensively throughout the eighteenth century but the last recorded activity was as late as the 1960s. Apart from safety work, much of the site remains unchanged. The ore was extracted by means of open pit and underground workings, the latter being extensive and on many levels to approximately 120 fathoms although only accessible to 45 fathoms as below that, all are flooded. There are four bronze-age sites accessible from one of the two remaining open adits and as such the site has been given SSSI status. The underground workings are maintained and explored by a volunteer group who host visits for academic purposes only but the whole surface area is freely open to the public. The site is ideal for carrying out site investigation work in the geosciences. Activities include geophysics to discover ground composition and hidden features, chemical / mineral analysis of the local environment and surveying of topographical features and the underground workings – much of which are believed not to be recorded to a sufficient accuracy. The results of the work undertaken provide the volunteer group with valuable information and the site offers a challenging environment for students to work within. The field work is an invaluable hands-on experience which prepares the students for work upon leaving university. The students this year were typical of previous years, being a mixed bunch from a variety of backgrounds, mostly from within the UK but also a few from overseas. Ages range from mid 20s to early fifties. They all have undergraduate degrees, mostly in Geology, Mining Engineering, Environmental Sciences, Geography, Biology and Archaeology. The post-graduate course introduces surveying to many who have no previous experience but by the year end they find it complements their own background very well and will quite often change their career focus to be more surveying oriented. The personal qualities and abilities of the students vary but all carry out their tasks with enthusiasm. A sizeable number of students present good technical ability and logical thinking with good communication and team working skills and there are always a few that stand out from the crowd in this respect. This year’s activities were to carry out topographic surveying of mine spoils, open pits, shaft caps and historic built features. The students were also taken on a guided tour of the underground workings through access tunnels and stopes. The conditions are fairly arduous but, for most, the visit tends to reinforce the idea of mining as a career choice. In a previous year, part of the mine was surveyed to determine the position of one of the bronze-aged stopes where the lower extents have been exposed underground – there is no visible evidence of the stope on the surface [Figure 1]. 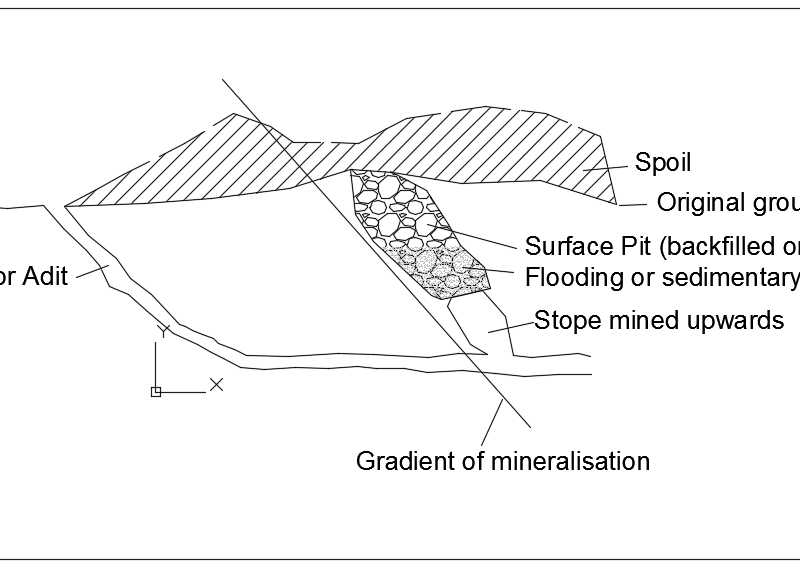 Figure 1 – Underground exposure of a bronze aged surface pit. The survey enabled the stopes position on the original surface to be marked out and a geophysical survey to be carried out which looked for possible voids – an obvious hazard to the general-public. There is also interest from an archaeological perspective. From my own perspective, I have learnt that training can require different approaches depending on the student’s personality. The field trip allows time for training to very small numbers and often on a one to one basis which, pays dividends over the normal large group learning experience. 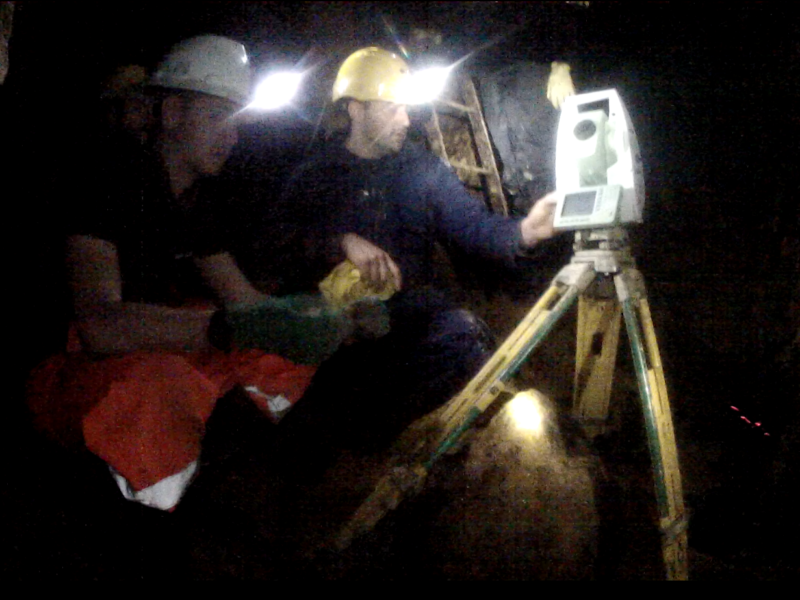 I have always succeeded in gaining a constructive relationship with each student by changing my style to suit the individual and considering the relatively brief period, I’m able to pass knowledge to a degree which gives each the confidence to seriously consider surveying – in mines or civils as a career choice. This aspect seems to come naturally to me and I do receive positive feedback from the students and the course leader.I am always given a very warm welcome on the field trip and my presence is very much appreciated. 2018 is my third year as a trainer since completing the course myself in 2014/15. My presence generates much interest and questions about working and surveying down a mine and many are set on taking up careers in either mining or tunnelling. Many take up positions overseas and the course enjoys a very high employability rate. Two students from this year’s cohort have expressed interest in the summer placement scheme and have been given contact details.